I just hope that Merlin doesn’t ask for his copy back, because there is all kinds of strange stuff stuck between the pages now and it has become a kind of no-go area for anyone with an allergy to feathers, or at least, small bits of feathers. And dubbing. And other unidentified things that are probably to do with tying flies but possibly not. Do we need another manual on CDC, possibly the most over-hyped tying material on this planet? No. 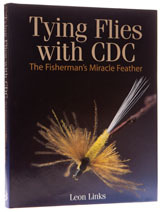 Do we need another book on fly-tying? Not really. Is this a good book? Yes, perhaps the best single volume on the subject ever published in the UK, in my opinion. Why so good? Well, the author’s style is definitely a little infectious and he catches the reader’s attention so early on that most people will never get to the end of the text, because they will have strayed to the tying desk, book in hand, and sat down, thinking, ‘Hmmm, I might try a couple of those and see if they work,’ and suddenly it is three am and they will be surrounded by clipped pieces of CDC and to sneeze will be to risk ending up looking like one of those snow scenes in a jar that you always wanted when you were a kid, but which no-one ever gave you.